Colorado is home to an enormous variety of landscapes. One of the most unique river basins in Colorado is the headwaters of the Rio Grande. This basin is bounded by the San Juan and the Sangre de Cristos Mountains, which funnel water to the San Luis Valley. It is a basin of sharp contrast, with the Great Sand Dunes National Park spilling sand out of the mountains and a productive agriculture community raising crops next door. Agriculture is the primary water user in the basin, but its use is limited by the Rio Grande Basin Compact, which divides the water of the Rio Grande among Colorado, New Mexico, and Texas. The Colorado Division 3 Engineer is charged with administering water use in Colorado so that enough water flows into New Mexico each year. 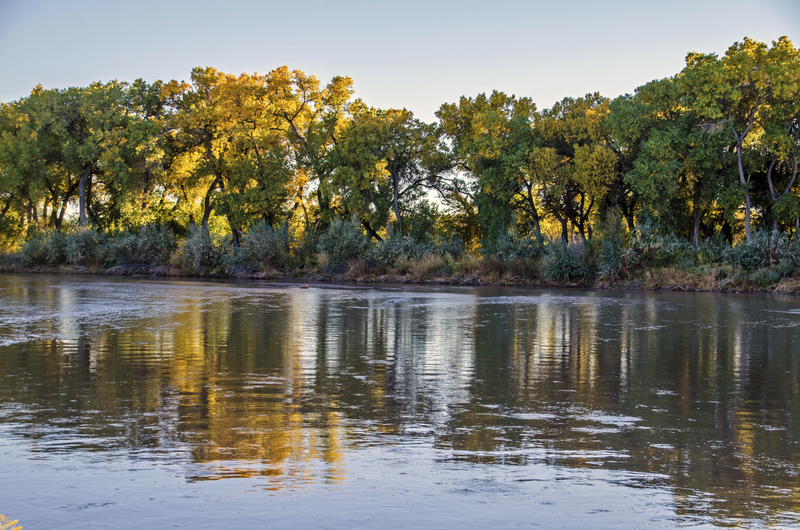 The Compact has identified four stream gages that serve as “index gages.” Depending of the total annual flow volume that passes each index gage, a set amount of water must be delivered to New Mexico. To make sure that the right amount of water flows to New Mexico, the Engineer curtails, or turns off, water diversions made in Colorado. It is a tricky balancing act. The Engineer wants to maximize the beneficial use of water in Colorado, but make sure that enough water is left in the river to satisfy the rules of the Compact. To administer the basin, the Engineer needs to know how much water will flow past the index gages. At the end of the year, that is easy to figure out based on the observations, but at that point, it is too late to deliver the water. So, how can the Division 3 Engineer know how much water will go past the index gages at the beginning of the year? Traditionally, he uses water supply forecasts provided by the Natural Resources Conservation Service (NRCS). Riverside Technology developed a new tool that uses long-range streamflow forecasts provided by the National Weather Service (NWS) West Gulf River Forecast Center (WGRFC). The tool is built in Excel and automatically pulls down the weekly forecasts, the observed streamflow, reservoir storage, diversions, and transmountain exports and imports. The tool automatically computes a range of possible index flows and therefore, a range of possible delivery requirements. This information is summarized in tables and graphs for easy review. The tool also allows the user to provide input on how the system will be operated, so different scenarios can be examined. Jay Day, Chief Engineer, and I went to Alamosa to deliver the tool on February 9 and 10, 2015. The training and demonstration went so well, we even got our names in the local newspaper, the Valley Courier! We’re awash in data about the world around us. We hear so much about the personal information the US government collects but what about data collected from the environment – about the atmosphere, the land, the rivers, the snow packs, the coasts, the ocean? The National Oceanographic and Atmospheric Administration (NOAA) collects more weather, water, and climate data than you could imagine. The main group responsible to preserve these data and make them available to the public, business, industry, government, and researchers is NOAA’s National Climatic Data Center (NCDC). Data come to NCDC from land-based stations, from ships, buoys, weather balloons, radars, satellites, and even sophisticated weather and climate models. From 2004 to 2013, NCDC’s digital archive increased from 2 to 14 petabytes. A petabyte is written as 1,000,000,000,000,000 bytes. So what can we do with all these data? That’s a question being answered by Riverside and our partner NEMAC on our project to link NCDC’s vast store of data with data about the people, homes, businesses, and towns around us. This is called socioeconomic data and, as the name suggests, it describes how economic activity affects and is shaped by all the social processes that surround us. When we combine the environmental data with the socioeconomic we can help people, communities, business, and government agencies figure out how much they might lose as environmental conditions change, either in the short-term with catastrophic storms like the northeast US has seen this winter, or long-term like the drought the western US has seen over the past decade. These data (environmental and socioeconomic) are out there. They’re just hard to get to or to understand once you do find them. Riverside and NEMAC are working to provide increased access to NCDC data using web Application Programming Interfaces (APIs) to connect weather, climate, and socioeconomic information to increase environmental intelligence by providing better access and visualization of these data sources. People who use these APIs will be able to combine environmental and socioeconomic data to create new products and to perform risk identification and analysis – that is, to understand what they might lose if conditions change. They can identify assets at risk and then generate ‘what-if’ scenarios to help protect those assets. Why are we doing this? Because data aren’t always in a form users need, and users don’t always know how to ask for the data they want. We want to assist communities and companies to be proactive and plan for the impacts of severe weather hazards, and to integrate environmental and socio-economic data to better understand and prepare for the impacts of severe weather. We want to help groups understand their Risk Exposure, be able to look at their assets and do a Risk Assessment, and learn what steps they can take to prepare for the consequences with a Risk Analysis. With help from NOAA through a Small Business Innovation Research (SBIR) grant, Riverside is building the data access and analysis capabilities to help people help themselves through better understanding of the world around them and how weather and climate can impact their lives. Shortly after the New Year, five Riverside employees traveled to the American Meteorological Society’s Annual Meeting in downtown Phoenix, Arizona. AMS is one of the year’s largest conferences for professionals from both industry and government in the atmospheric and hydrologic sciences. Riverside has attended and participated in AMS conferences for more than a decade, and it remains one of the best places to connect with our customers and partners from across the world. As always the University of Oklahoma throws a wonderful reception, and this year was no exception. The evening event this year was hosted at the Arizona Science Center with hundreds in attendance, and the exhibits were open for all to visit. The outside water exhibit was a huge highlight (see photo). Also, our own CEO, Dr. Larry Brazil, was recognized as an AMS Fellow. AMS Fellows are announced each year at the annual conference and are recognized for their outstanding contributions to the atmospheric or related oceanic or hydrologic sciences. Congratulations Larry – this honor is well deserved! Riverside considers the 2015 AMS conference another success, and we hope to see everyone next year in New Orleans.